1. In a pan over medium-high heat, melt butter until golden. Add onions and turn up to high heat. Fry onions until crisp, stirring occasionally. Once cooked, set aside. 2. While onions are cooking, fry up bacon in separate pan. Once cooked, set aside. 3. In a pan over high heat, cook Burger to order (4-5 minutes per side for medium-rare). 4. 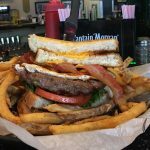 While Burger is cooking, cook up two grilled cheese sandwiches and set aside. 5. Fry up one large egg to order (over-easy, over-medium, well done). 6. 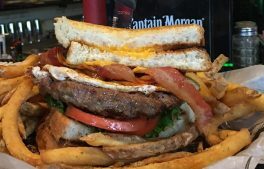 Build Your Steeler Burger: grilled cheese sandwich, lettuce, tomato, Burger, onions, bacon, fried egg, grilled cheese sandwich. 1. In a skillet over medium-low heat, melt butter until golden. 2. Place slices of bread onto pan and quickly flip until both sides of both slices are coated in melted butter. 3. Place slices of American cheese onto one slice of bread and cover with second slice. 4. Cook for 3-4 minutes or until golden. Then flip and cook for an additional 3-4 minutes or until golden. Just before sandwich is done, use the Quick Steam Method to melt cheese more thoroughly if desired. Pro Tip: The Quick Steam Method involves squirting about a tablespoon of water around the Burger (or grilled cheese sandwich) and quickly covering with a pot lid. The steam that forms will be trapped by the pot lid and allow the cheese to melt much faster. Be careful when attempting this method as adding water to a hot surface will produce very hot steam (and if the surface is coated in oil, splash back may occur).